As they say, the eyes are the window to the soul, something we must take care of or we are at a huge disadvantage. 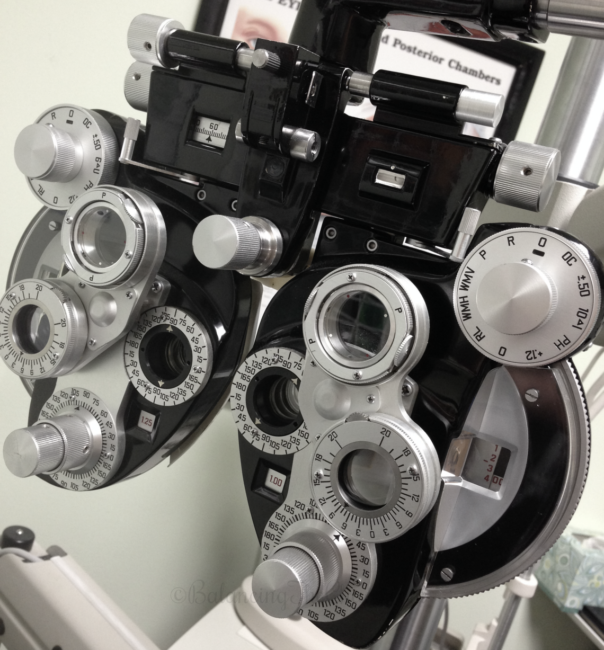 As we’ve gotten older, my husband and I have noticed a change in our vision, knowing it is time to visit our optometrist, but how often should we go? How often should the kids have their eyes checked? I had the opportunity to speak with Dr. Annie Tran, OD at Kaiser Permanente, who has worked closely with the Orange County Chief of Ophthalmology and Pediatric Ophthalmologist, Dr. Ashish Mehta MD. They gave me insight on eye screening, annual exams and things to keep in mind when it comes to eye care. For children, school screenings typically screen for distance VISION, while a “Well Child Exam” checks for distance vision AND ensure vision milestones are met. All Pediatricians are well trained to assess for normal visual development. At Kaiser Permanente, there is a robust visual screening program for verbal children beginning at age 4. If an infant, toddler or verbal child is suspected of having a visual problem or fails a visual screen, they are referred to an Optometrist or Ophthalmologist for a comprehensive eye exam. The American Academy of Ophthalmology (AAO) and American Association for Pediatric Ophthalmology (AAPOS) does not necessarily recommend routine comprehensive eye exams for every single young child, but holds that different age groups have different guidelines, when they are recommended to have comprehensive eye examinations. An infant’s vision is screened at their first doctor’s visit typically by a Pediatrician. Most newborns can only see approximately less than a foot in front of them (typically 8-10 inches, or essentially the distance from baby to mom or dad’s face). By 6 months, a baby’s vision starts to resemble that of what an adult might see, and there is another eye screening done by a health care provider at well child exam around 6-12 months. 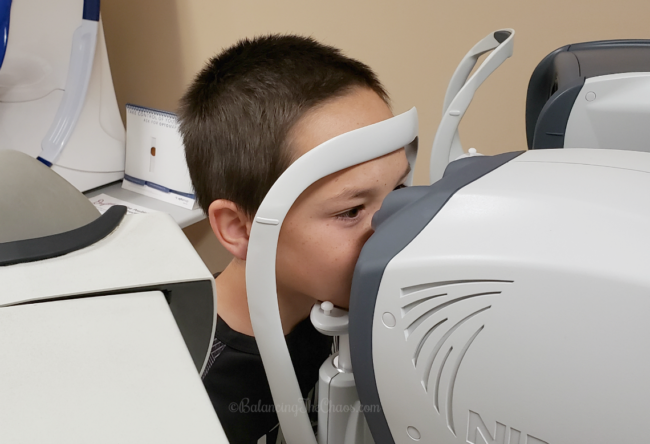 Elementary schools conduct a vision screening, which is where we caught an initial problem with my son’s vision when he was in the 1st grade. The school nurse and the vision screening staff discovered a difference in vision from one eye to the other, later diagnosed by an optometrist as amblyopia; also known as a lazy eye. 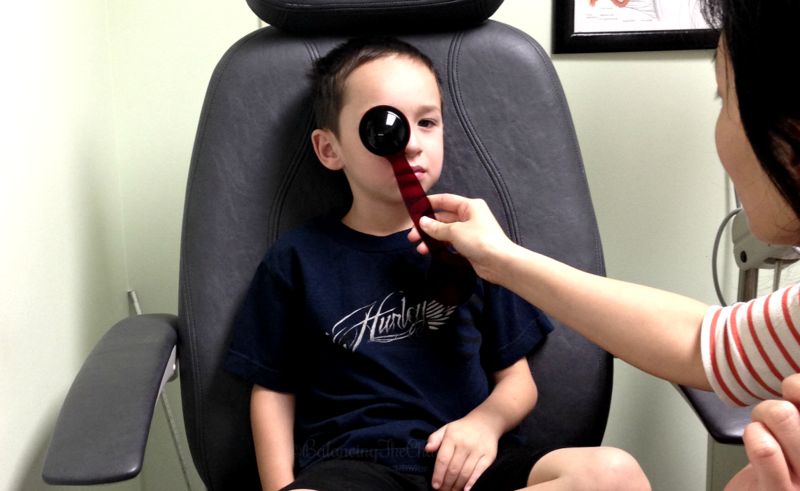 It is important to note that early eye examinations are VERY important with children. At ages 4 and 5, some vision issues can potentially be corrected because the child’s vision is still developing. At ages 6, 7, and even 8, the visual system is more developed, which ca sometimes makes correcting certain eye problems more difficult. With my son, wearing glasses for a year when he was 6 years old, helped to correct his visual system and eye development, and ultimately corrected his lazy eye (amblyopia). While this might not be the exact case for all children, Kaiser Permanente’s pediatric ophthalmologist recommends having a child’s eyes screened by their pediatrician at age 4 and every year thereafter until the age of 8. For school-aged children, they recommend a comprehensive eye exam if the child has failed a vision screen, the pediatrician notes a problem, or the parents note a visual issue. Hyperopia: commonly known as farsightedness, is condition that can sometimes cause distance vision to be seen more clearly than near objects. However, a high amount of hyperopia can cause vision to be blurry at far or near. High amounts of hyperopia or myopia can sometimes lead to amblyopia, more commonly referred to as “lazy eye”. Myopia: Often known as near-sightedness. It causes distance vision to be blurred. Astigmatism: eye is slightly football or oval shaped and causes blur at distance and near, and often times glare at night. When it comes to our screen time: cell phones, iPad, iPod, computer, games, gaming consoles, etc., using eye muscles to use these gadgets isn’t really a bad thing. In general, when you are using your eye muscles, and any prolonged near work can potentially strain your eye muscles. The ciliary muscles inside the eye, pull on the lens inside the eye and changes the shape of the lens, allowing the eye to focus images from far to near and near to far. Extended periods of focusing on something close, whether it is a screen or a book, actually puts stress on the eye. Something as simple as looking up and focusing on an object in the distance can rest your eyes. Dr. Tran recommends something called the “20-20-20 Rule”: 20-minute intervals of screen time or near work, broken up by looking at something 20 feet in the distance for 20 seconds to help relieve the eye of stress. I was so excited to speak with Dr. Tran about our vision and how to take care of our eyes. As a parent, I’m always wondering if too much screen time is doing more damage to my children’s vision. It is nice to have the reassurance that we are doing the right things and making the right decisions for our family. Now that I know that they can take little 5 minute breaks, I’m not going to tell them – this is one of those times that I will keep this little secret, only because too much gaming causes irritable children in my book. It’s great that a health care provider like Kaiser Permanente Orange County and their physicians, go beyond simply offering health insurance coverage. They become a families’ health care partner. Whether explaining the nitty-gritty on how to read plan coverage, to sharing what to expect at doctor’s visits, to making sense of the latest in health care news, they’re a great source of information for moms and families. As a Kaiser Permanente member, you’ll have the ability to select from many services such as: primary and urgent care, emergency facilities, labor and delivery, pharmacy, and lab all housed under one roof. The ability to choose your own doctor based on their specialty is an added bonus. Additionally, when you register through kp.org you can view most lab results, email your doctor’s office non-urgent questions, schedule and cancel routine appointments, and even manage a family member’s health. Find out more today at: kp.org/orangecounty. Connect with Kaiser Permanente via social media, visit Facebook or Twitter.